When buying home theater seating, one if often faced with the decision of which material to select to best match the needs and style of the theater room. In the custom home theater world, the selections are vast and this article hopes to provide a guide to navigate through this decision making process. 90 % of all home theater seating sold in the market today is sold in black and dark brown leather. Black leather (and it's synthetic look-a-likes) have dominated that category by 3:1. Fabrics have become more popular as textiles have moved to imitating the look and feel of leather to the point where you cannot tell the difference. These are called faux leathers and they hit a great price point with an even better durability than the real thing. This is not to be confused with bonded leather which is a synthetic - vinyl on the outside - and real leather on the inside. The real leather is actually production off-cuts ground to pulp and then mixed with an adhesive and pasted to the back of the vinyl to give the hand touch of real leather. Sounds off-putting? 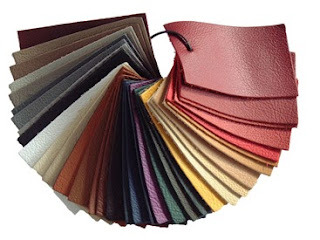 Well it shouldn't - bonded leather has risen in popularity more than any other textile in the history of the business in a short period of time. Most seating comes in one of two ways as it relates to leather. Full leather or leather match. Leather match is when the genuine leather exists on all the seating surfaces of the chair which includes the seat back, arm rests and foot rest - any portion of the seat that your body touches. A perfect synthetic vinyl match exists on the exterior seat back and the lower exterior sides.